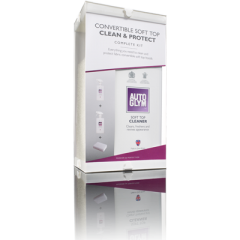 The Convertible Soft Top Clean & Protect complete kit contains everything you need to clean and protect your soft top. Suitable for use on any mohair, double duck, fabric or canvas fabric hoods. 1.Mask off bodywork area and dampen convertible top with water. 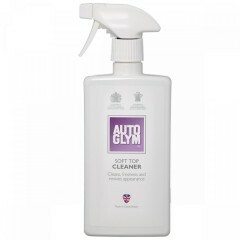 2.Shake Soft Top Cleaner well before use and spray over entire convertible top surface. 3.Agitate with sponge provided and thoroughly rinse using a low pressure hose or watering can ensuring all product is removed. Pat surface dry to remove surplus water. 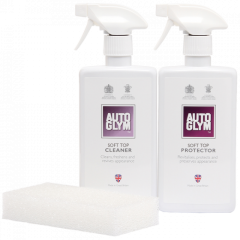 4.Spray Soft Top Protector over the entire convertible top surface and remove any overspray from windows and bodywork immediately. 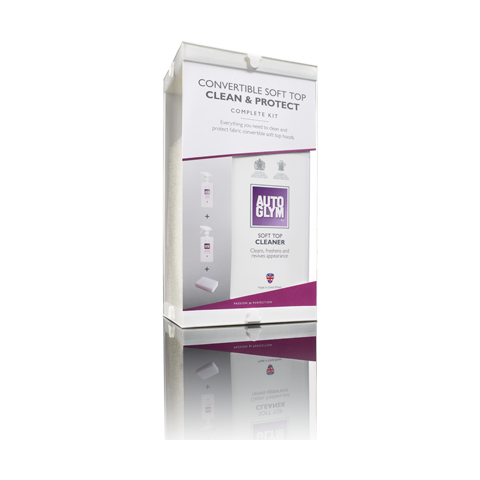 5.Allow Soft Top Protector to fully dry before driving. Store product at room temperature and do not allow to freeze. 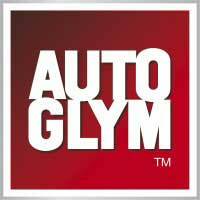 For a vinyl hood, clean thoroughly with Bodywork Shampoo Conditioner then protect with Bumper & Trim Gel. Please refer to the full instructions detailed on the enclosed bottles for more detail.Wash the supplied accessories as required in clean, warm water and allow to air dry.